What is Ready to COPE? 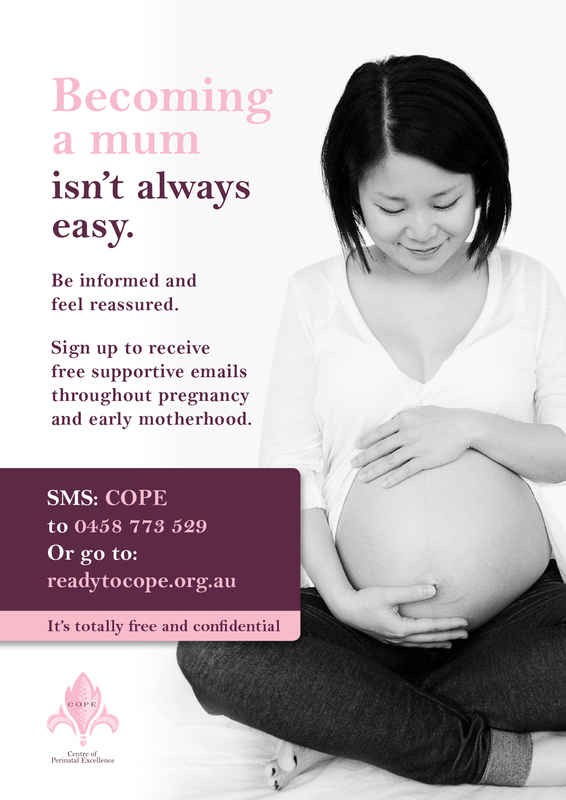 Ready to COPE is a free e-newsletter that provides women with timely, relevant information about their emotional and mental wellbeing throughout their pregnancy and first twelve months following the birth of their baby. COPE developed Ready to COPE to help women become aware of the range of common challenges that they may encounter in the perinatal period. Ready to COPE provides women with insights, comfort and strategies for coping as well as information on when and how to get help if needed. 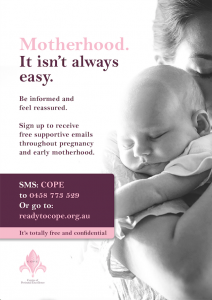 Ready to COPE is a beautifully-designed, digital and sustainable way for perinatal women to learn more about their emotional and mental health. It is completely portable and can be viewed on any device. Every email contains links to getting help, additional fact sheets on the issues addressed and the ability to access all prior emails in the series. It is completely free and confidential. Importantly, Ready to COPE contains information and links to resources that are underpinned by the Australian Perinatal Mental Health Clinical Practice Guideline. The information is developed to inform and empower consumers and families and support health professionals that make up COPE’s member organisations. What are the key benefits of Ready to COPE? 3. Educating women so they are able to identify possible signs of stress, anxiety or depression in themselves or others, and have an understanding of why, how and when to seek help. How can women can sign up? Women can sign up for free by going to www.readytocope.org.au. To sign up, a woman must provide her name, email address, postcode and expected date of delivery (if pregnant) or the date of her baby’s birth (if postnatal). This information is completely confidential. After signing up, she will receive a welcome email, followed by fortnightly emails that correspond to her current perinatal status (emails arrive more frequently in the immediate weeks after baby is born). How can I promote Ready to COPE in my healthcare setting? To support the uptake of Ready to COPE in community and healthcare settings, simply print out one of these downloadable posters and place it in a visible spot in your waiting and/or clinical room. You may also want to inform your patients about Ready to COPE in your social media and/or newsletter communications. To do this, you can direct women to www.readytocope.org.au to sign up and use any of the following images. You can also use the Ready to COPE promotional video in your setting or communications (a closed caption version is also available). If you have any questions or would like further information about promoting Ready to COPE to your patients, please contact us at readytocope@cope.org.au. More information is summarised in this Ready to COPE fact sheet. Why share Ready to COPE with women in your care? If you are a healthcare provider for perinatal women, you are on the front line of helping women prepare for and travel through this critical time in their life. You are no doubt aware that many women emotionally struggle during the transition to parenthood, and you probably see women every day who are having trouble coping with different aspects of pregnancy and motherhood. Ready to COPE makes it easier for you to help your patients be better prepared for and cope with the more difficult parts of their journey through pregnancy and early motherhood. By recommending to your patients that they sign up to Ready to COPE, you are providing them with continuous access to trustworthy, evidence-backed information that will help them understand and look after their mental and emotional health, feel less alone and get help if needed. How can I get in touch about Ready to COPE? If you have feedback, ideas and suggestions, you can get in touch by emailing us at readytocope@cope.org.au. We will get back to you promptly.